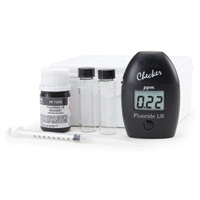 The Mini Fluoride Checker Test Kit is an impressive test kit for fluoride. It can spot low levels of fluoride in tap water. Yes, it is small actually fits into the palm of your hand but it is big on convenience with large and easy to read digits. 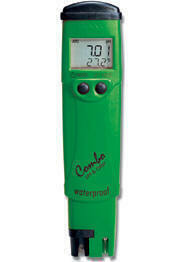 Use the Mini Fluoride Checker for quick and accurate analysis. The Mini Fluoride Checker Test kit is simple to use. For this measurement you need 2 vials (#1 and #2); in both vials add 2 mL of reagent and until the mark: deionized water in vial #1 and sample in vial #2, and gently invert 5 times, and wait 2 minutes. Then insert the cuvette #1 into the Mini Fluoride Test kit and press the button to zero; after that cuvette #2 to read the measurement results. The Mini Fluoride Test kit comes with complete test instructions. You will be able to make six tests with this kit and you can purchase additional reagents to do more tests. Fluoride has been claimed to have beneficial effects on teeth at low concentrations in drinking-water, but a flood of research revealing several adverse effects is calling into question claims of benefits from fluoride. It is known that excessive exposure to fluoride in drinking-water, or in combination with exposure to fluoride from other sources, can give rise to a number of adverse effects.